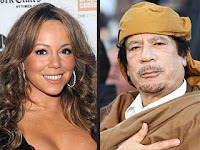 LOS ANGELES, Calif. -- Mariah Carey and Charlie Sheen are the latest celebrities to admit that they had financial ties to Libya. Carey accepted payment to perform for Libyan leader Muammar Gaddafi. Charlie Sheen, who has reportedly paid Gaddafi’s government over $2 million, came clean about his purchases of Libyan moonshine, exotic prostitutes from the presidential harem, and for babysitting services. Members of the Gaddafi family themselves oversaw the child care responsibilities for Sheen’s five children, treating them to an authentic Bedouin experience by dragging them deep into the desert and forcing them to sleep alone in a tent. Carey was just 16 in 1986 when the United States bombed Libya in response to a terrorist attack carried out by Gaddafi’s forces on a Berlin discotheque. The military action, code-named Operation El Dorado Canyon, injured 2,000 and killed at least 100, including Gaddafi’s adopted 15-month old daughter. The singer’s statement follows in the wake of similar announcements from stars Beyoncé and Nelly Furtado, who have also been criticized for accepting money to perform for Gaddafi. Beyoncé said she already donated her earnings to the Clinton Bush Haiti Fund. Furtado has also vowed to give her money to a charity that has nothing to do with assisting the Libyan people, insisting that these actions support the UN sanctions levied against Gaddafi. Mariah Carey told reporters that the next time a foreign dignitary offers extravagant sums of money for a private performance, she will have one of her staff research the individual. When reporters corrected Carey by pointing out that Kim Jong Il -- a diminutive but tyrannical autocrat -- controlled North Korea and not Li’l Kim -- the popular American rapper -- Carey appeared visibly shaken and confused. When asked for his comments, Charlie Sheen claimed that he invented the schwa and said that his urine is made of stardust from Betelgeuse.